I grew up believing lasagna was a very special meal. My mom would make it when were were having company, or on a special occasion. To me lasagna is for a special time, made with special love. I also love garden fresh vegetables. Whether I’ve grown it myself, gotten it at a farmers market, or a stand on the side of the road. This roasted zucchini and summer squash lasagna has combined those two joys for me to make a dinner with significance. In July and August you can find zucchini and summer squash everywhere. And if you’re like me, you’ve even grown them in your own garden. Zucchini is so versatile. You can use it in treats like brownies, and sweet breads, you can use it in pasta dishes, I’ve even added it to ground beef in hamburgers. This lasagna recipe keeps it looking and tasting like a zucchini. The summer squash isn’t as versatile, but so delicious when cooked with a little oil and seasonings! If you have a great summer supply of fresh tomatoes you can peel and dice about about 12-15 of them and use them instead of canned tomatoes. Combine these seasonal veggies and you’ve got yourself a magnificent dish. Another food that’s best during the summer is Fontina cheese. In Italy cows are brought up to higher elevations and fed tall green grasses, then milked especially for fontina cheese. It may not be a regular on your grocery list, but it’s earthy Italian flavor will make your Parmesan and mozzarella a little bit jealous. While some people may be skeptical of using oven ready lasagna noodles, I actually like them better. Not because they are easier to use, but for some reason, I like the dryer texture better then those I have boiled. This is the most colorful, flavorful, and tasty lasagna I have made to date. So when those summer vegetables pop up everywhere, give this recipe a try. It won’t disappoint you. 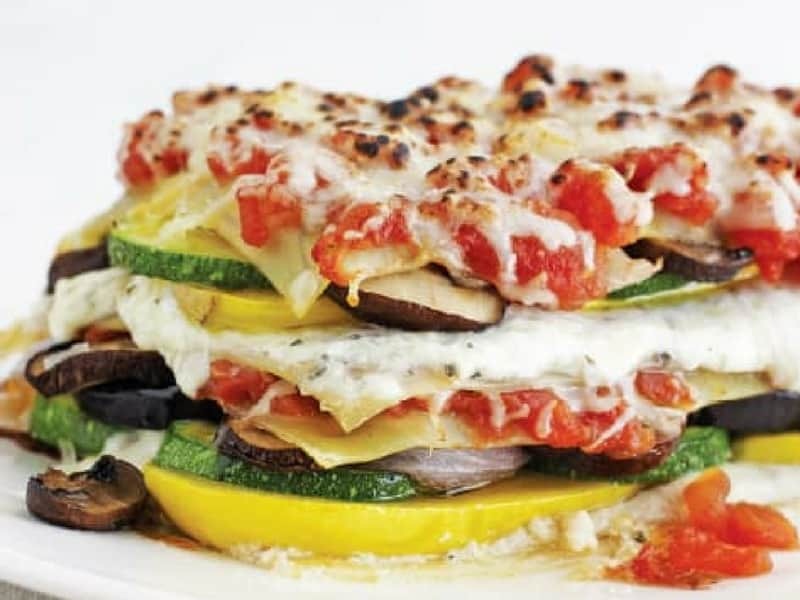 This roasted zucchini and summer squash lasagna is bursting with flavor and bright colors! When your garden is filled with zucchini and summer squash, this is the perfect way to use your harvest. Preheat the oven to 425°F. Lightly spray 2 baking sheets with cooking spray. Arrange the zucchini and yellow squash in an even single layer on the prepared baking sheets. Brush with the olive oil and sprinkle with 1 teaspoon of the salt. Roast until tender and browned, 25 to 30 minutes. Remove from the oven and set aside to cool. Reduce the oven temperature to 350°F. Spray a deep 9 x 13-inch lasagna pan with cooking spray. Combine the ricotta, half of the mozzarella, the Fontina, egg, basil, oregano, pepper, and the remaining 1 teaspoon salt in a large bowl. Stir well. To assemble: Cover the bottom of the pan with one-quarter of the noodles, overlapping them slightly. Spread half of the ricotta mixture over the noodles. Follow with half of the roasted squash, and top with a layer of noodles. Spread with half of the tomatoes and half of the remaining mozzarella. Top with another layer of noodles, the remaining ricotta mixture, the remaining squash, and another layer of noodles. Finish with the remaining tomatoes, the rest of the mozzarella, and the Parmesan. Lightly spray one side of aluminum foil with cooking spray. Cover the lasagna with the foil, sprayed side down, so that the melted cheese wont stick. Bake 30 minutes, remove the foil, and continue baking until golden brown and bubbly, 10 to 15 minutes. Let rest 10 minutes before slicing. Variation: Add some other veggies form your garden, such as eggplants and red peppers. And if you like mushrooms, they can add a lot of flavor. I always add mushrooms to mine!